Barnes & Noble Bringing the Nook Line to the U.K.
Barnes & Noble is looking to go global this autumn by offering its Nook e-reader in the U.K. Announced this morning, Barnes & Noble will be launching both the Nook Simple Touch and the Nook Simple Touch with GlowLight beginning in the next few months at Nook.co.uk. There are plans to add sales through brick & mortar stores and additional online channels, but no word as of yet as to which companies those will be. 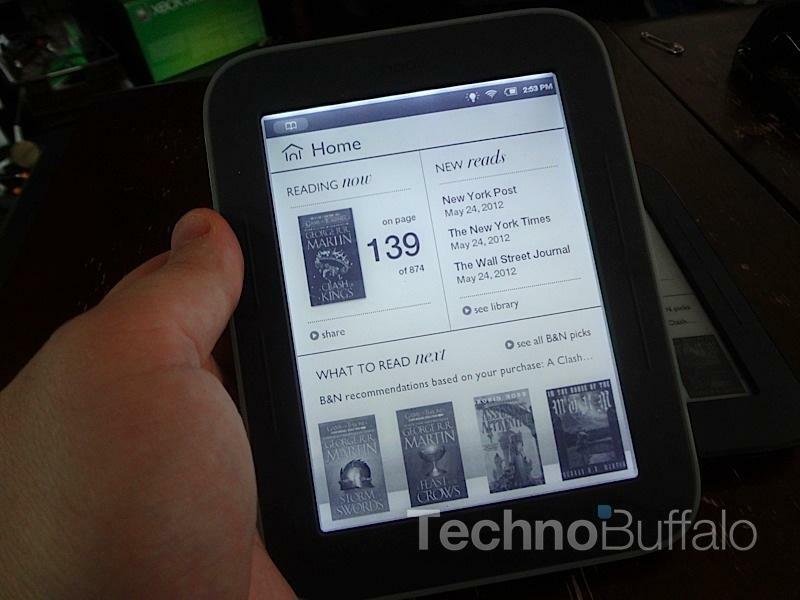 While the Nook Tablet is not mentioned as being available at launch, it is pictured on the accompanying site along with its name, so it seems safe to assume that it will be available in these territories at some point. We loved the Nook Simple Touch with GlowLight when we reviewed it, so congratulations to our friends in the U.K. that it will finally be available to them. New York, New York – August 20, 2012 –Barnes & Noble, Inc. (NYSE: BKS), the leading retailer of content, digital media and educational products, today announced that its award-winning NOOK reading experience and leading digital bookstore are coming to the United Kingdom this autumn through a new www.nook.co.uk online storefront, marking the first time the company will expand its business internationally. The world's largest bookseller will also offer its highly sought-after NOOK digital products and content to UK reading and entertainment lovers through partnerships with leading retailers expected to be announced shortly. These well-known UK partners are expected to support the NOOK offering there through both established physical and online channels. The first products to be available when the company begins offering its products in the UK in mid-October include Barnes & Noble's line of critically acclaimed E Ink® Readers, NOOK Simple Touch™ and NOOK Simple Touch with GlowLight™, the top-ranked eBook readers in the US. "We are proud to be able to offer our top-rated line of NOOK reading devices and our award-winning digital bookstore to the discerning and highly educated consumers in the UK," said William J. Lynch, Chief Executive Officer at Barnes & Noble. "We're confident our award-winning technology, combined with our expansive content – including books, children's books, magazines, apps, movies and more – will bring UK customers the option they've been waiting for." With its highly acclaimed NOOK offering, Barnes & Noble has been a leader in creating innovative products that provide the best digital reading and entertainment experience for millions of NOOK customers. The company's many groundbreaking advancements in the digital reading space include creating the 7-inch Reader's Tablet™ category, and the world's first E Ink device with a built-in light for reading in the dark. NOOK products are currently sold in the US at NOOK Digital Shops™ and counters in more than 1,300 Barnes & Noble and Barnes & Noble College Bookstores, and through top US retailers. The popular NOOK Simple Touch and NOOK Simple Touch with GlowLight are set to launch in the UK in time for the holiday shopping season. NOOK Simple Touch is the easiest-to-use Reader with the world's best, most paper-like reading screen and longest battery life. NOOK Simple Touch with GlowLight adds a patent-pending lighting technology for reading in the dark, so it's like two devices in one, as amazing at the beach as it is in bed. Both of the lightweight devices feature built-in access via Wi-Fi to Barnes & Noble's leading digital catalog and an ergonomic form with a soft-touch back that's comfortable to hold for hours. Starting this autumn, UK customers will be able to shop an expansive NOOK Store™ featuring more than 2.5 million digital titles – including top-selling UK books, newspapers and magazines – plus comics, exciting NOOK Apps and more. UK NOOK customers will be able to "Read what they love, anywhere they like™" on NOOK devices as well as their favorite mobile and computing devices using free NOOK reading apps. Purchased NOOK content is always safe and available through NOOK Cloud™. UK residents wishing to learn more about NOOK can visit www.nook.co.uk.